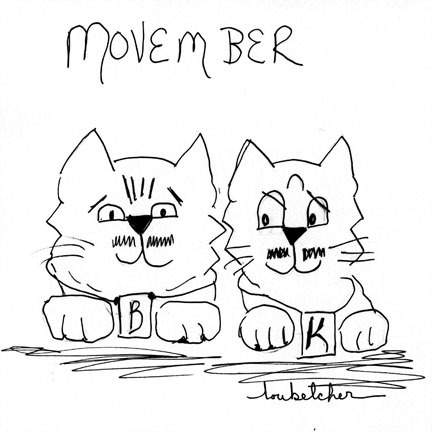 Welcome to the Sunday Funnies… We put up our beginning Movember pictures when our mustaches were tiny so you’ll be able to compare. As you know, last weekend HH was at the book fair. It was a good one and she said she sold some books. We think that next year she should let us go. We think we could have a line around the block. But there’s a whole year to plan for that…. Today we are concerned about Christmas. 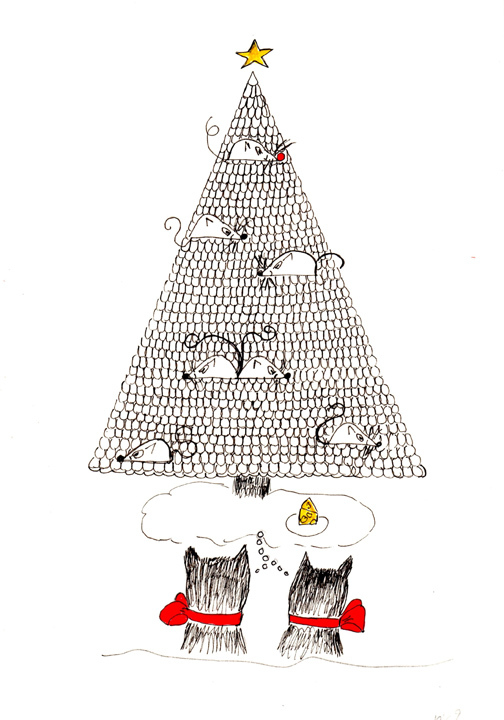 First, we wanted to show you some of our old Christmas Cards…. Now… DrumRolllll please… Here is our Sunday Selfie with our mustaches fully grown. Betcha didn’t think we could grown such handsome mustaches…Surprise! 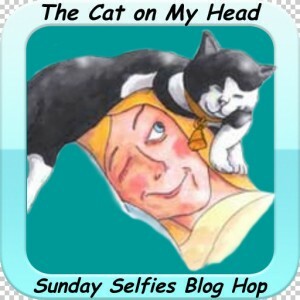 We’re participating in the Sunday Selfie Blog Hop… Why don’t you join too…Our pals at The Cat on My Head are hosting it. That’s it for this week… And we just wanted to mention that HH didn’t make a turkey this year, so if you want to send us some leftovers, we’d be most appreciative. 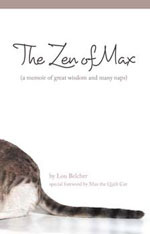 This entry was posted in The Boys, Uncategorized and tagged bugsy, cat art, cats, Double Trouble, feline art, humor, Knuckles, Lou Belcher, Sunday Funnies, whimsy. Bookmark the permalink. Looking very handsome, boys! I’m afraid to see what other tips you’ll be sharing with your furry friends. YOu 2 are so silly- nice staches. 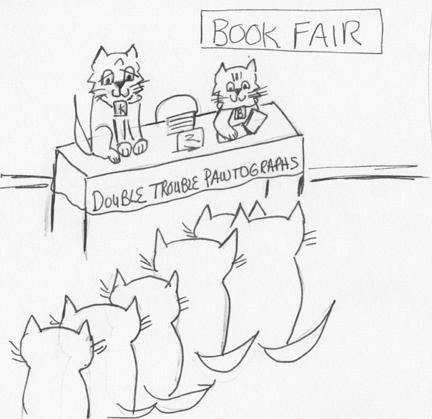 I do think you would help sell books, no one can resisit kitties. That is a wonderful tree climbing tip! 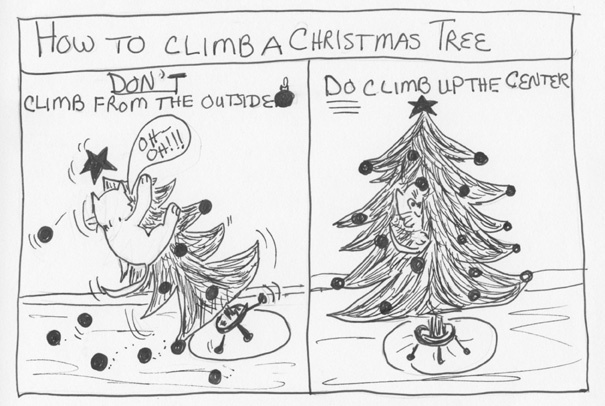 OMC, I love the tip about how to climb a Christmas tree! This is my first Christmas so I need lots of tips on how to properly celebrate. Your mustaches sure have grown !! Oh yes… It is EXTREMELY important to find your ‘center of gravity’ when climbin’ a tree. You guys should definitely get to go to the book fair. No one could pass up the book if your cuteness was around! I love to climb up the middle of the tree too! Those are some very impressive ‘stashes though! 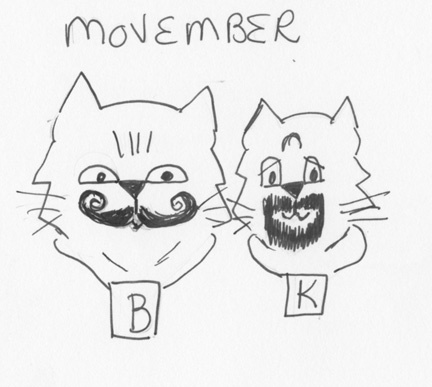 Your moustaches are awesome, guys! And that tree climbing tip is golden — thanks! We agree that if you two went with HH to book signings, the line would stretch for miles. 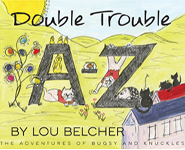 Thank you for a fun blog post. Oh it made mum laugh. Maannnn we know the tree thing. 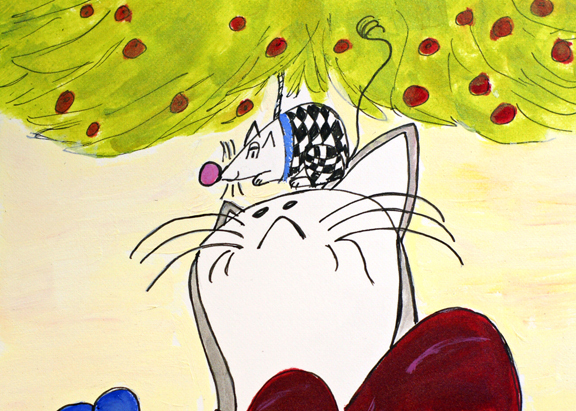 Silver * looks to his right * and Miranda * looks to his left * both climbed the tree as kittens!